Vitamins and minerals are essential nutrients our body needs in small amounts to work properly. Vitamins are organic compounds and vital nutrients that an organism requires in limited amounts. There are 13 vitamins necessary for healthy body functioning. Export Portal offers a great choice of vitamins for your health. If you want to buy vitamins and all kinds of medical supplies, it is important to define what kind of vitamin you need. Vitamins have many different biochemical functions. Some, such as vitamin D (cholecalciferol, ergocalciferol), have hormone-like functions as regulators of mineral metabolism, or regulators of cell and tissue growth and differentiation, for example, some forms of vitamin A. Others function as antioxidants, for example, vitamin E (tocopherols, tocotrienols) and sometimes vitamin C (ascorbic acid). The largest number of vitamins, the B complex vitamins including vitamins B1, B2, B3, B5, B6, B9function as precursors for enzyme cofactors, that help enzymes in their work as catalysts in metabolism. Vitamins of B complex are also known as thiamine, riboflavin, pantothenic acid, biotin, pyridoxine, folic acid and folate. Vitamins are essential for the normal growth and development of our body which requires certain vitamins and minerals to be present at certain times. People who eat a vegetarian diet may need to take a vitamin B12 supplement. Each vitamin has specific jobs. Some vitamins may help prevent medical problems. Vitamin A prevents night blindness. Mostly, vitamins are found in food, but a few are obtained by other means. For example, microorganisms in the intestine - commonly known as "gut flora" - produce vitamin K (phylloquinone, menaquinones) and biotin, while one form of vitamin D is synthesized in the skin with the help of the natural ultraviolet wavelength of sunlight. Humans can produce some vitamins from precursors they consume. Examples include vitamin A (known as retinol, retinal, and four carotenoids including beta carotene), and niacin, from the amino acid tryptophan. People have to consume vitamins periodically but with differing schedules, to avoid deficiency. Shop for vitamins online and choose the best for your health! 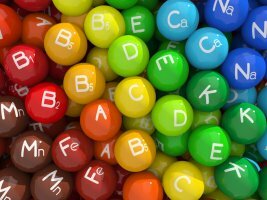 The human body's stores for different vitamins vary widely; vitamins A, D, and B12 are stored in significant amounts in the human body, mainly in the liver, and an adult human's diet may be deficient in vitamins A and D for many months and B12 (cyanocobalamin, hydroxycobalamin, methylcobalamin) in some cases for years, before developing a deficiency condition. However, vitamin B3 (niacin and niacinamide) is not stored in the human body in significant amounts, so stores may last only a couple of weeks. For vitamin C, the first symptoms of scurvy in experimental studies of complete vitamin C deprivation in humans have varied widely, from a month to more than six months, depending on previous dietary history that determined body stores. Use vitamins, food supplements, provitamins and multivitamins attentively and take care of your health! Vitamins are divided in 2 categories: water-soluble vitamins or fat-soluble vitamins. Water-soluble vitamins dissolve easily in water and, in general, are readily excreted from the body, to the degree that urinary output is a strong predictor of vitamin consumption. Because they are not as readily stored, more consistent intake is important. Many types of water-soluble vitamins are synthesized by bacteria. Fat-soluble vitamins are absorbed through the intestinal tract with the help of lipids (fats). Fat-soluble vitamin regulation is of particular significance in cystic fibrosis. The best way to get enough vitamins is to eat a balanced diet with a variety of foods and take the right amount of vitamins to complete the need. Export Portal welcomes you to buy vitamins here, on the huge selling platform, to find all kinds, types and manufacturers. We offer a great place to sell vitamins online, because finding customers here is easy and safe. Use the opportunity to work with us and get the best deals!